that’s the day you promised to come back to me. According to legend, on 19 March each year, St. Joseph’s Day, swallows migrate some 6,000 miles from Argentina to San Juan Capistrano in Southern California and people from all over the world come to see this returning of the swallows, a tradition celebrated from the early 1900s. Like the returning swallows of San Juan Capistrano, this March we have a gathering of columnists and commentators, analysts and academics, bloggers and blowhards, politicians and pontificators, newscasters and nitwits, lawyers and law-abiding citizens, all coming out of the woodwork to express their two cents worth when the United Nations High Commissioner for Refugees (UNHRC) convenes annual sessions to discuss, debate, pass resolutions on matters concerning human rights issues around the globe. Coincidentally, around the time the swallows arrive in San Juan Capistrano, a report on Sri Lanka was submitted to the UNHRC, titled ‘Promoting reconciliation, accountability and human rights in Sri Lanka by the Office of the United Nations High Commissioner for Human Rights’. Unlike the swallows of San Juan Capistrano who after a long and arduous flight from the southern hemisphere come to peacefully nest in San Juan Capistrano, the human gathering around UNHRC annual sessions seem to display some signs of restless nervousness and agitation. Granted, these are well-meaning people with wide and varied opinions. We have seen them all on the local airwaves, newspaper columns, on social media platforms, etc. Notably, they have expressed their opinions in these columns as well – strong opinions about democracy, freedom of expression, good governance, individual freedoms, civil rights, etc. Sharmini Serasinghe stands out among all those who have gathered to voice their opinion on the UNHRC sessions in Geneva, having gathered notoriety standing up to the Rajapaksas, openly defying them, challenging them and even going as far to say if anything untoward should befall her, the Rajapaksas should be the cause of it. She stood on a platform at a mass rally under the banner, ‘Voice of Justice’ to protest the October 2018 action taken by President Sirisena. She thumped her chest and let out a battle cry asking the masses to follow her towards the President’s office and demand his ouster – if he had any sense of self-respect. If you were like me in the front rows of that rally, you would have seen the fire in her eyes and felt hot breath out of her nostrils – an absolute replica of Hindu Goddess Kali, the destroyer of evil forces! Goddess Kali is believed to be the divine protector and one who will liberate you from all bonds of this earthly misery and deliver you to the heavens. Serasinghe screamed her head off reminding us that only spineless toads (kondha naethi gembo) would elect drug lords, rapists and child-molesters as their representatives and legislators. Her words were powerful, inspiring and a call to action. Those of us who watched her fiery delivery were so pumped up we were ready to take to the streets and join the protest and risk it all. She said “api yamu” (let’s go) and nothing was there to hold us back! The judicial system in Sri Lanka once again intervened in the nick of time, acted impartially, handed out rulings thwarting all illegal actions by the President thereby reversing previously taken actions by the President null and void. Every one of us let out a collective sigh of relief and were looking forward to getting life back to normal. That was October 2018. But now it’s March and the swallows returned to Capistrano..! Yes, it is the 40th session of the UNHCR convened in Geneva late February and held until 22 March and brought forth the band of pundits and professors with their own analysis and pontifications and conspiracy theories. No one expects there to be a consensus and unanimous position among the various stakeholders in their analysis and positions. Divergent views should be welcomed and promotes healthy debate. And along came Sharmini Serasinghe with her story of lambs to slaughter! Curiously, her views required a good look and an analysis of our own. Like the famous commercial for E.F Hutton, stock broker in the US says, “…when E.F Hutton speaks, everybody listens...” Now that our own Goddess Kali herself has spoken, let’s listen. For starters, according to Serasinghe, “No one cares a damn about the UNHRC sessions anymore”! She goes on to opine, only two groups – the present Government and the disgruntled Tamil diaspora – give validity to these Geneva sessions of the UNHRC, if at all! She further doubles down on her charge that former Navy Commander Wasantha Karannagoda is the fall guy and is being sacrificed by the present Government to appease the international community! We have never seen such distortion of facts by someone who otherwise seems to put forward rational and reasonable arguments in print and delivers fiery speeches from podiums inspiring the masses to rise up and protest whenever an injustice is done. We are talking about “Voice of Justice”. Tens of thousands of people who suffered under the brutality of the LTTE and alleged war crimes committed by the armed forces during the final stages of the war have taken the matter to an agency that by its mandate has given a voice to these people to air their grievances and seek redress. They did not take the matter to UNHRC as their first line of action. The aggrieved parties tried hard for several years at the end of the war in 2009 to find a solution internally dealing with the Government to address their concerns. When they were simply ignored and were given the run around, international communities got involved and found a voice for these voiceless people in Sri Lanka to air their grievances in an international forum, the UNHRC. Sadly, Serasinghe labels these voiceless and aggrieved people, “disgruntled Tamil diaspora”! Even greater tragedy, the UNHRC is labelled by Serasinghe as a worthless agency no one gives a damn about! Now, the matter of Wasantha Karannagoda as the sacrificial lamb! By all accounts, this matter has been progressing through the slow and deliberate wheels of justice since 2009 when it was first reported that some Navy personnel may have been involved in the abduction for ransom scheme which ended with the killing of eleven youngsters. Any rational person would consider this an alleged crime that Karannagoda is charged with and the judicial system must grind through the process, gather evidence and reach its conclusion and deliver a verdict. But what we have is a preposterous connecting of the dots, linking the timing of the Karannagoda matter coming up before the court system now with the conspiracy of the present government to make him the fall guy to appease the international community. There is an old saying in Tamil, paraphrased, says that it is a coincidence that the ripened fruit of the Palmyra fell – not the weight of the crow that sat on it caused it! Just because you do not agree with the present Government, accusing that the Government is conspiring to charge former Navy Commander now to score points with the international community is an argument that is mind boggling! A scorpion foraging for food in the woods came near a stream and wanted to cross to the other side to find something to eat, but was stymied by the fact he couldn’t swim. He spotted a frog happily floating down the stream and appealed to him to give him a ride across to the far side. The frog told the scorpion, everyone knew how mean the scorpion was and feared he would sting him midstream and refused to oblige. The scorpion pleaded with the frog assuring he wouldn’t do that because the frog was his friend helping him and further, if he stung both of them were doomed. The frog bought into that logic and got shore-side and got the scorpion to hop on its back and proceeded to swim to the other side. When he got to the middle of the stream, the scorpion stung the frog and injected a load of venom into the frog’s neck. The frog became dizzy, paralyzed and started to sink taking the scorpion down with him. As he was sinking the frog pleaded, ‘Why did you do that? Now both of us are going to die’. The scorpion replied, ‘I couldn’t help it; it is in my nature’. Hindu Goddess Kali handed out justice to all equally and equitably with fairness and impartiality. Kali stood for justice and destroyed evil in whatever form it occurred. But our local avatar of Goddess Kali, Sharmini Serasinghe seems to have her favourites when it comes to fighting evil and delivering justice. 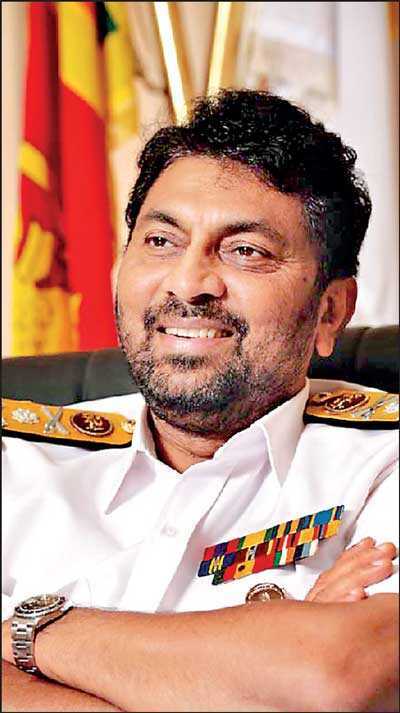 Our own Goddess Kali, Serasinghe, has made Karannagoda her favourite cause célèbre for justice, embracing him singing his praises handing out commendations and citations even the navy commanders themselves did not bestow upon him! Let Karannagoda have his day in court. Serasinghe artfully clouds the issue and muddies the waters with unfounded conspiracy theories that the present Government is manipulating the process in bringing Karannagoda to justice at this time to coincide with the present UNHRC sessions. A valiant fight we agree that our own Kali is putting forth in the defence of Karannagoda. But when Tamils want justice, our own Goddess Kali dismisses them as “disgruntled Tamil diaspora”. I am wondering, like the scorpion in our story, if Serasinghe’s true nature that is coming to the surface now – deeper darker feelings of racism, prejudice and bigotry.